A fundamental question in forest ecology is, “What is the impact of long-term environmental changes on forest ecosystems and how do they respond to these changes?” An understanding of these processes is important in two major ways. First, it can give insights on basic community and evolutionary processes such as colonization dynamics and migration. Second, it will be useful in predicting forest responses to future climatic and other environmental changes. A lake sediment core from the Upper Penisula of Michigan. The core will be dated, and ancient DNA from plant macrofossils will provide insights into pre-historic forest population structure. In northeastern US forests, climatic changes in the past 8000 years, followed by broad-scale deforestation in the last 500 years, have led to forest community shifts and to changes in tree population abundance through time. 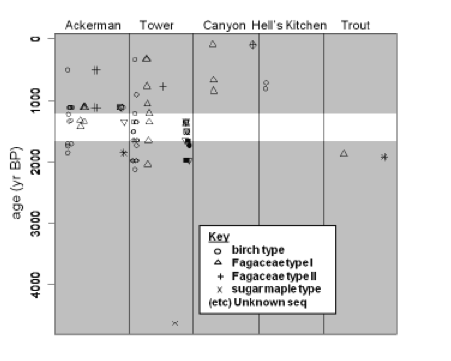 Inferences of such forest community shifts have been mostly based on paleoecological reconstructions of fossil pollen records, allowing for quantitative assessment of historical population dynamics (David 1981). As uncertainties (taxonomic challenges and spatial imprecision as pollen can disperse far from source) can sometimes underlie such reconstructions, a more direct (and complementary) way to assess impact of long-term climatic changes on forests is to use ancient DNA extracted from lake sediments. Further, ancient DNA from thousand-year old lake sediments in combination with modern DNA can yield valuable insights on long-term trends in population turnover or changes within species and the associated genetic changes. Working with Hendrik Poinar of McMaster University, we have been able to extract, amplify and sequence chloroplast DNA from ~6000 year-old fossil pollen and macrofossils in late Holocene lake sediments from the Upper Peninsula in Michigan (Anderson et al. 2011). Sediments less than 1200 years old are genetically distinct from sediments over 1700 years old in both Tower and Ackerman Lakes (Figure 1).